Is China Really a Friend to Africans? How far we should trust China? Over the last decade China has received a favorable PR on the way that it deals with Africa. The perception is that China’s a-political approach of engaging Africa is good for Africa. It is also deemed that China’s economic investments are positive for Africa. The low bid contracts by Chinese companies are seen to be good alternative from the West that traditionally strangulated Africa with debt. China is helping African countries develop some capacities in various fields. These are amongst some of the advantages China provides African countries. In November of 2006, China organized probably the largest gathering of African countries outside Africa a “China Africa Summit”. The gathering was hailed by African leaders because they believed it to be a good sign for future China-Africa relations. There were press accounts detailing satisfaction of African countries because they perceived that China was looking to partner with African countries. The very fact that China held the gathering was a big deal, a-first for Africa and, a knock at Western nations that treated Africans with utter disrespect for generations. China’s involvement with Africa has its critics and supporters. The most glaring objection is that China is dealings with countries that the West claims-have bad human rights records. China is accused of encouraging corruption and corrupt leaders. China is criticized for not focusing on governance and human right issues. And for systematic denial of African countries from manufacturing their own products because of China’s insistence on selling products produced by China. In a nut shell this is the extent of the critical view China gets from the West. China is the “anti West” in the way that it deals with African countries. For example in Ghana, a $270 million loan facility to carry out expansion works at the Kpong Water Project was agreed upon between the government of Ghana and China. What is different about the loans China provides Africa is the fact that these countries can use their resources, in effect bartering in exchange for projects, goods and services that these African countries need in this case, water. The Chinese have a lot of dollars that they must dump. This is leverage that Africa never had with the West. What does it mean when we say is China a friend of Africa? How should friendship between China and Africa be defined? How deep of a friendship is China cultivating in Africa? How good of a friend is China to Africa? What does China’s friendship mean to African countries? And the main question; is China a friend of Africa? For a layman and according to various dictionaries, a friend is: a person whom one knows, likes, and trusts; an acquaintance; an ally in a struggle or cause; a comrade; one who supports, sympathizes with, or patronizes a group, cause, or movement and, a member of the Society of Friends. Using the basic understanding of the meaning of friendship, can Africa trust China; consider China as an ally and be confident that China is a comrade in the struggle towards economic emancipation and development? Can Africa “trust” China to support and be the party that stands for the security of Africa? Is there a country in Africa that has ties with China that remotely resembles the example above? Does China have allied countries in Africa? During the Cold War, the alliances were almost clearly defined. The countries that were pro-West received support from the West led by the US, and vice versa. Can African countries count on that type of support from China? While the author is not an advocate of Africa divided based on the interests of super powers; it is important to note that countries enjoyed qualified diplomatic and military support during that era from one side or the other. However, while the current world is considered to be multi-polar, the main powers are the US and China. These are veto wielding powers capable to impose their will on any nation around the world. Ironically, while the US is clear on whom their friends are and her interests; it is extremely difficult to gauge China’s intentions. And absent of any pronounced friendship with any country in Africa it is nearly impossible to say where China stands with any nation. It is important to ask these questions of China considering the extent of China interaction with Africa over the last thirty years. It is even more crucial in light of the resolutions United Nations Security Council (UNSC) produced over the last ten years that profoundly impacted many countries in Africa. In 2005 alone, nearly 80% of the 70 deliberations and decisions the UNSC made were related to matters in African countries with the Middle East coming far-second and Third World countries such as Haiti and Bosnia Herzegovina filling-in the blanks. The reality is 2005 is not an aberration it is the annual reality in the UNSC. And the problem is the fact that the UNSC is making all these decisions without the affected parties having a say and a fighting chance against decisions that are affecting these nations in some cases altering the social landscapes violently. Moreover, the role China played or lack thereof is by far the most perplexing. One needs to look at some of the recent developments in Africa pertaining to Libya, Sudan, Eritrea and others vis-à-vis Security Council decisions that the West and particularly the US perused in the region. China went along with decisions when it seemingly could impact its national interests. These decisions raise some serious questions about Chinese intentions and dealings in Africa. China has been in Sudan for decades and it is one of the reasons why Sudan remained viable. China has heavy investments in Sudan primarily in the oil sector. China imports an estimated 7% of its oil from Sudan. Moreover, China has a sizeable human-resources invested in various sectors. In other words China’s investments in Sudan are numerous, extensive and took decades for China to build it that level. Yet, when we look at the future security and stability of Sudan, the West led by the US appears to be on the driver’s seat basically dictating terms while weakening Sudan and nailing wedges designed to fragment the nation into pieces. It is ironic because the US pushed measure after measure using the UNSC that China can stop using its veto power. Moreover, if one is to add Eritrea into the mix it makes one wonder what China’s underlined interests are. Nearly all of China’s goods from Sudan are channeled through the Red Sea. Eritrea owns a large and strategic lane on the Red Sea. Eritrea is also bordered by Sudan. If Eritrea is to be what Ethiopia and the US wanted to be (an entity under their control in whatever shape or form); then Sudan would be encircled by countries that are propped by the US and, the US would have assumed control over the entire eastern part, the Horn, and the Northern parts of Africa. The US is in Djibouti, Ethiopia, Kenya, Uganda, South Sudan, Rwanda and Egypt. The only countries left are Sudan and Eritrea. If the US is to succeed by accomplishing what they planned for Eritrea after World War II, then Sudan would have no fighting chance because it will be encircled. Moreover, US and her allies would have controlled the entire Red Sea territories namely Egypt, Sudan, Eritrea, Djibouti on one side and, Saudi Arabia, Yemen on the other. They will have the chokehold for any shipment that sails through that area. A good example to glean from is the Suez Canal and Iran. Eritrea controlled by the US can potentially limit China’s access to the area and give US the upper hand in the region. It is with this background in mind that the author questions China’s role. Why is China allowing the US to pass measure after measure to pressure Sudan and Eritrea? The US, on Xmas Eve of 2009 imposed a sanction measure, by concocting lies and fabrications in the most brazen way that disregarded the existence of the people of Eritrea. They used a mechanism and methodology that denies Eritrea a say and moved along with a sanction. LI BAODONG statements are very troubling. Firstly, he stated that China wants the situation to have a peaceful end. And secondly China is against use of force. He continues, his delegation had asked specific questions that failed to be answered and, therefore, it had serious difficulty with the resolution. The most troubling statement however is, “It had not blocked the passage of the resolution, however, because it attached great importance to the requests of the Arab League and the African Union,” and passed a resolution with a vague and open-ended language that allowed NATO to destroy Libya in the name of protecting civilians. The Irony, first of, the African Union was disregarded. And secondly, this was taking place in the most turbulent times in the history of the Middle East when countries were embroiled on their internal civil struggles. China passed the resolution not to protect the best interest of the people of Libya but to satisfy a nonexistent or a nominal Arab League and African Union. It is even more perplexing considering the number of Chinese that worked in Libya and the amount of investment that China had in Libya. This begs the question; why is China allowing punitive measures against nations that are friendly; nations that are doing business and, nations that have accepted not only the diplomatic core but the Chinese people all around Africa? Why is China allowing the US and Western nations to take advantage of UNSC resolutions for their hegemonic objectives. The No Fly resolution was just a hook because soon after the decisions were made the French, UK and US did bait-and- switch, called for a regime change and escalated the operations including sending advisors into a civil war. The people of Libya are being terrorized by the most intensive bombing campaign the continent of Africa has ever seen. The people of Libya are being exposed to depleted uranium; Libyans are suffering and not better off. And contrary to China’s wish of peace, Libya is ensnared by violence of the brutish NATO forces. In short, China’s repeated abstentions do not absolve it from the responsibilities. Dambisa Moyo and others have said a great deal of good about China’s economic programs in Africa. However, no-economic success means a-whole-lot unless coupled by peace. Africa’s problems are chronic by design and they continue because the West is intent on keeping Africa crippled. 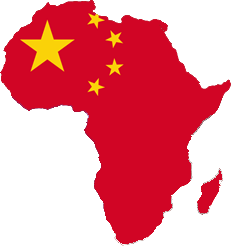 China was Africa’s first and best hope to counterbalance the negative role the West continues to play in Africa. Instead, China is tacitly accepting the label of new colonizer of Africa. On a setting that resembles a Hollywood’s scary witch-movie, Secretary Hillary Clinton stood on a dark room on a podium in Ethiopia and warned Africans to beware of the new colonizers that do not care about Africa. Her statements are evidence that Africa has effectively turned in the dinner table of hyenas and lions fighting for a carcass only this time; it is with the impending holocaust of the African continent. The question is what can Africans do? The UN/UNSC is an organization designed to benefit the five permanent members at the expense of the world. The UNSC has literally turned the international order into that of the Jim-Crow laws that punishes without representation, due process and to send a message. They have established systems they can manipulate as they wish like the ICC that they are using to petrify leaders such as Beshir to get what they want. They are penalizing the people of entire regions based on their national interest-considerations and denying them the right to live in peace. Moreover, these are people that have never been able to establish institutions that can sustain them in bad times such as draught. The continuation of this holocaust is reaching biblical proportions. Yet, they are escalating these strategies. The reality is there is no recourse for these transgressions and deliberate injustices. Therefore, the responsibility befalls on those countries that are being negatively affected by the injustices. Hence, the only solution is for nations to abandon the defunct UN and disqualify its purpose and create a mechanism to deal with world matters. Moreover, united vigilance of the people is far more important than ever because they are openly returning Africa back to the colonial era. China could also assume the just role of defending African because ultimately that will serve its interests in the right way.